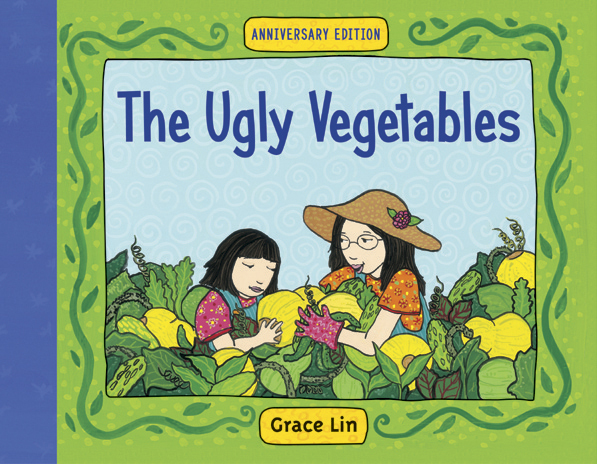 In The Ugly Vegetables, author and illustrator Grace Lin‘s narrator is excited about planting a garden with her mother, but her joy quickly turns to concern as she notices all of the things that her mom is doing differently from their neighbors. Why, she wonders, does it seem that everyone else is doing it differently? Her mama patiently reassures her that they are growing something better than the flowers everyone else is growing– their garden is dedicated to growing Chinese vegetables! As the summer progresses and it comes time to harvest the garden, the narrator learns that her mom’s garden does indeed yield something more special than flowers. When the lumpy, bumpy vegetables are cooked together in a soup, the neighbors come knocking, entranced by the smell. And, importantly, they bring an abundance of flowers from their own gardens to share. Ms. Lin’s bright illustrations depict a lively communal meal in which even the dog gets her own bowl of Ugly Vegetable Soup. There are several reasons that this book is a great choice. The unique-to-us vegetables are fun to think about (and pronounce, even if you do not have fluency in any of the Chinese languages). Ms. Lin has skillfully reproduced the nuances of the child’s perspective, from the initial crabiness at doing things differently to the eventual pride that she feels in the fact that the smell of the soup, which wafts throughout the neighborhood, is coming from her house. The celebration of the neighborhood and illustrations of the sharing that occurs in their community are also compelling components of this tale. The end of the book contains a guide to the vegetables described in the story and a decidedly non-vegetarian soup recipe, (although if you are lucky enough to obtain all of the vegetables, it wouldn’t be difficult to veg up the soup by swapping vegetable broth for chicken broth and seitan, tofu or Gardein for the chicken/seafood if you feel inclined). Parents may enjoy reading Ms. Lin’s blog, which is aimed at the grown-up demographic.